Following the events of the surprisingly solid Doomed crossover event, Superman’s world has seen some considerable changes: Smallville is recovering from a biochemical attack that took the lives of many of its citizens, Lana Lang is dealing with the loss of her parents and the start of a new relationship with John Henry Irons (a.k.a. Steel), and Clark Kent has grown a beard to show that he’s not the same clean-cut hero anymore. 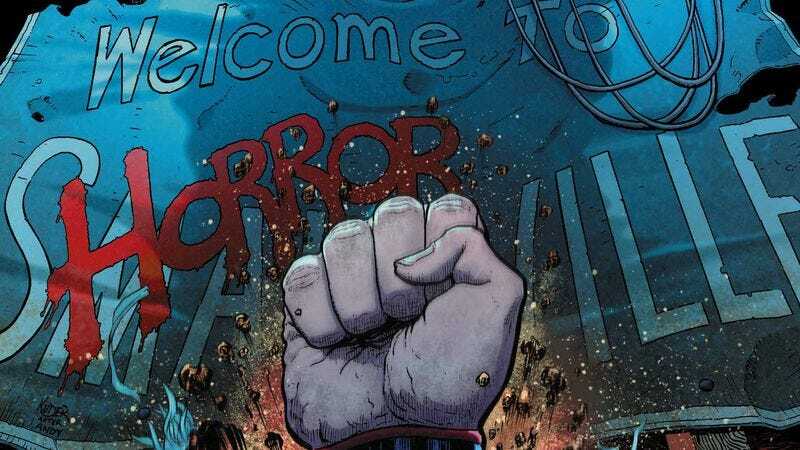 The aftershocks of Doomed are still being felt, and this week’s Action Comics #36 explores the psychological impact of the past few months’ events by pushing the comic into a new genre: horror. The first Action Comics storyline by writer Greg Pak, artist Aaron Kuder, and colorist Wil Quintana did exceptional work taking Superman in a direction influenced by pulpy fantasy adventure, and using the character to explore different genres is a wise move that makes the series feel less like a conventional superhero comic. The best thing about the Pak/Kuder/Quintana run is the emphasis on Lana Lang, making her a character whose bad-assery is matched only by her intellect, and the spotlight continues to shine on Lana in this preview of Action Comics #36.